This blog focuses on industrial, inline process refractometers and their use in industrial applications. Refractometry is used to measure the refractive index of a substance in order to determine its composition or purity. Posts include information on theory, construction, installation, new products and new markets. The Electron Machine Corporation manufactures a BLRBAC compliant Black Liquor solids monitoring system designed specifically for Black Liquor Recovery Boilers. The Black Liquor Recovery Boiler Advisory Committee is a group that exists for the purpose of generating safety procedures and guidelines that govern the operation of Black Liquor Recovery Boilers. The BLRBAC was formed in 1961 by several groups of concerned professionals that had become alarmed by the number of Black Liquor Recovery Boiler explosions. The MDS Monitor Divert System consists of two completely independent MPR E-Scan Hybrid-Digital refractometers with a separate monitor console that supervises the proper operation of each refractometer. 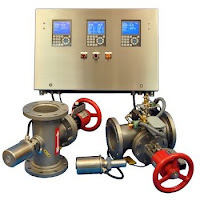 The monitor constantly insures that all parameters remain within operational limits and applies the proper divert or alarm actions should a fault or low solids liquor be detected. A built-in printer records all actions with a date and time stamp. The entire system is designed to be user friendly with large daylight-readable color displays and an intuitive menu-driven interface. Isolation Valves are also required to meet the BLRBAC guidelines and allow the refractometer sensing heads to be isolated from an active pipeline should maintenance be needed. The system closely monitors the position of these isolation valves to verify that the refractometers are in service. All functions of the MDS Monitor Divert System are automatic. For example, should a refractometer fault occur the unit is electronically removed from service and an alarm is activated. Simultaneously the output signal is driven low to warn the operator to disregard this reading. The monitor system then isolates, displays the fault and provides a hard copy record on the built-in printer. Liquor diversion is now controlled by the refractometer in service. The MDS Monitor Divert System is pre-wired and mounted on a panel for easy installation. All customer connections are made to a single terminal strip. 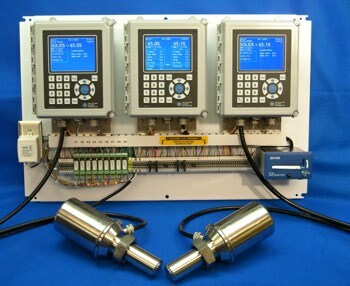 Standard output is a 4-20mA for liquor concentration with relay contacts for liquor divert, alarms, and system error indicators. A remote divert input is also available. The system can be provided in an optional stainless steel enclosure with either a vortex-cooler or fan ventilation depending on the specified mounting location. For more information on the BLRBAC visit here. For more information on the MDS Monitor Divert System visit here. Manufacturer of the world's most rugged in-line process refractometers designed to provide safe, reliable, and accurate measurement & control in the pulp & paper, food, and chemical processing industries.